Dor-en-Ernil comprises all the land between the rivers Gilrain and Ringló / Morthond including the hilly penninsula called Belfalas. To the west lies Anfalas, Lebennin to the east. The Realm of Dor-en-Ernil is an autonomous provice in the heart of southern gondor. Two of the most important ports lay within its borders and the capical Dol Amroth is neighbored to the famous elven city of Edhellond. The name "Dor-en-Ernil" is sindarin for "Land of the Prince". The Principality has long prized its autonomy from the central realm. The first inhabitants of the land were the Druedain who arrived in the last centuries of the First Age. At the end of the First Age came the Dean Coentis from the east who settled the lands at the Ered Nimrais (S. "White Mountains"). In the Second Age came the Sindar who founded Edhellond (S. "Elf-haven"). By 1700 S.A. the Edhellond had become a significant port for the Elves. After the war against Souron in Eriador, the Noldo Galadriel come with her spouse Celeborn to Belfalas. She decided to settle next to Edhellond on a rocky promonotory jutting into the bay call Tirond Aear (S. "Sea-spire"). There she erected a a tower called Tirith Aear (S. "Sea-ward Tower"). After 1800 S.A. the Guild of Venturers arrived around the Bay of Belfalas, bringing Numenorian settlers mostly to todays Lebennin. The Guild was led by Imrazôr in this days - and in the later history was banned by the king. In 3319 S.A. Gondor was founded by Elendil the Tall and his sons Isildur and Anarion, the heirs of the Uinendili. It was the famous Lord Edhelion - a man who was treated by the elves as one of their own kind - who secured and developed the region between the River Gilrain and the Ered Tarthonion. In need to reward this invaluable service High-King Elendil accorded Edhelion the title of Ernil (S. "Prince") and the Land became know as Dor-en-Ernil (S. "Prince´s Land"). In 830 T.A. Tarannon ascended the throne of Gondor and the Princes were granted the western coast of Belfalas as well. Dunedain poured into this fertile land. Galadriel, realising that the age of men has come, resigned Tirith Aear to the reigning Prince, who committed himself and his successors to maintain its warning bell. 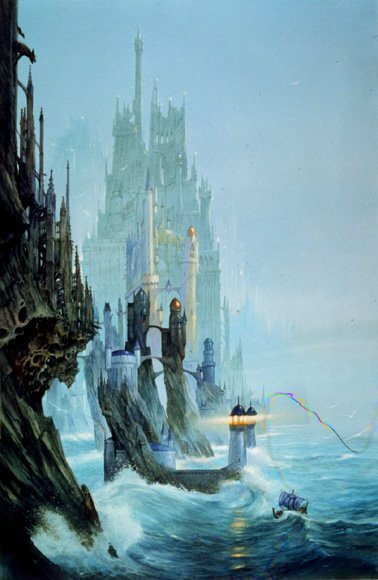 Aided by the Sindar of Edhellond the Prince raised a mighty Castle on the peak above the Elven-tower. The new capital named Lond Ernil (S. "Princ´s Haven") was build below the fortress.This fine port would later become known as Dol Amroth (I prefer this name and use it all the time :). Gondor´s Kin-strife (1432-48 T.A.) was mostly fought in the Anduin Valley. The House Edhelion stayed neutral in this conflict, but many poeple of Belfalas went to join Castamir army and never came back. Dor-en-Ernil was not only wealthy and the people masters of their craft, the Kin-strife strengthened the political position of Dor-en-Ernil. After the war the rebels fled with most of Gondors fleet to Umbar and started raiding the castal regions of Belfalas. The Prince was forced to strengthen the castles and construct a system of coastal fortifications. With hard labor he succeeded and diverted most of the raiding towards other regions. severe in Dor-en-Ernil. After the plague Central Gondor again grew weaker and the autonomy of Dor-en-Ernil grew again. That is the point were most of ICE´s stuff starts. Belfalas has a long, rounded and hilly coastline between the mouth of the river Morthond and the Gilrain. The western coast is dominated by steep cliffs and rocky coves. On the eastern side are less dangerous sea-rocks sometimes you find beaches and marches. It is still impossible to land with bigger ships at the Belfalas coast apart from the habours. The average temperature at the coast is warm, the inner parts of Dor-en-Ernil are slightly cooler. Generaly the climate is perfect: you have a mild winter, prolonged spring and autumn and a warm, dry summer. Precipitation is regular - very frequent in spring while the peak storm season is late autumn. The coastline is never clam, but only in spring and autumn it is really windy. Occasionally winds from the sea dance around the Ered Nimrais - suddenly spilling into the narrow river valleys. The inner vales generally are calm in summer, the mountains breezy. In winter the coast is rainly, the inner vales and mountains have moderate snow. The foothills of Ered Tarthonion are heavily are heavily wooded.The lower vales are filled with deciduous tree including oaks and cedars. Getting higher, the way is given to mighty pines. The deltas of the rivers Gilrain and Morthond have only a few large trees. Moss-hung cypresses can be found around small lagoons. Waterfowl and other birds could be found. Swarms of insects fill the air. Myriads of fish fill the estuaries. Closer to the bay are clam beds and burrowing crabs. Vast beds of plankton, marine plants, crustaceans and shellfish have their home at the bay. Even lager ocean creatures are attracted by the large food supply. You can find sharks, whales, dolphins, rays, sea-snakes and sea-turtles as well as fell-turles and kranken. In the Ered Tarthonion still a few decendants of the Daen Coentis settle. These people are referred to as Eredrim. Akin to the Dunlendings in the North, they are a bit darker. Generaly the eyes and hair are brown. Men often wear mustaches and thick beards. They rarely get older the 80 years, starting with the physical decline at around 60. They are a secretive folk, the last of a dying culture in these lands. Social Life: A small warrior aristrocraty rules the villages. The main part of a village are farmers and herdsmen. The wealth is shown by the number of cattles a man ownes. Stealing in the own village is regared as a major offence, stealing cattle elsewhere is regarded as admirable act of manhood. Only men go to war, but the woman are known for their courage in defending the homes. There is low unity under the villages, loyality goes to the villages and the clan. They dislike their Dunadan overlords - and flee on the sight of elves. Culture: the Eredrim speak a dialect of Dunael, very rare even some broken Westron. The Shaman is the only literate in these villages, many conversing in Daenael (Old Dunael). The male clothings consists of plain earthen-hued woolen tunics and trousers, wooden clogs or leather boots. Woman wear linen shifts and woolen dresses and also wooden clogs. Only Chieftains and Warriors possess fur mantles and brightly colored clothing. The food is mainly bread and vegetables, only chieftains and warriors can afford regular meat and ale. Houses are of stone, wood or wattle-and-daub. The animals are stabled at one end of the house. Gatherings with food and games are quite common, even between villages. Religion: Eredrim are very superstitious. They generally follow their shamans and believe in the Valar and Natural spirits. Sacrifices are very comman. Cremation is the traditional funeral ceremony. A minority follows dark cults. Under the influence of Saurons agents they follow the "old ways", remembering the power there ancestors had while following the Dark Lord in the old days. The Dunadan of Dor-en-Ernil have a good shot elvish blood in there vines. Magic isn´t that bad reputated as in the rest of Gondor, and the ties with Edhellond are quite close. Their appaerance is remarkably tall, black hair, shining grey eyes and fair skin. The man are clean-shaven. Social Life: the land is ruled by a feudal system. There is no dishonour in being a framer or fisher and everyone is a free man, also able to move from one village to another. They pay rent to the local manor lord. The family structur is conservative. Men are warriors, woman play supportive roles as counselors and healers. The Inhabitants are fluently in Sindarin and an archaic, chivalrous-sounding version of Westron. Nearly everone is literate, knowing people often also know Quenya and/or Adûnaic. The traiding people often also know the languages of some neighboring countries. Culture: Men wear long waist-belted tunics, made of linen or light wool. In cooler weather they wear fur or wool mantles and trousers. Sandals and soft boots are common. Ceremonical colthing reflects evlish style. The diet is various and tasteful: sweet bread, meat, fish, cheeses, many fruits and vegetables. Wine, mead and ale are enjoyed. The preferrd building material is stone, and their ability in stoneworking is only surpassed by Dwarves. Nobleman enjoy riding , hawking and hunting for leisure. Commonmen enjoy swimming along the shores and diving from the cliffs. Sailing and the local kind of chess are commonly pleasure. Religion: The Dunadan worship Eru without organized rituals. There is a form of ancestor worship. Although even in Dor-en-Ernil elves are rarely seen, there happen to be a few in the capital Dol Amroth. Where Morthond and Ringlo meet the ocean lies the port of Edhellond - the only elvish settlement in the whole Gondorian region. Not officially a part of Dor-en-Ernil, the Prince and the rulers of Edhellond respect each other and Edhellond keeps the elvish strike in the Belfalas culture alife. Social Life: the leaders of Edhellond are principially Sindar.Silvan (or Avari) make up the ranks of the common folk. Many elves never marry, while those who do have several children. Culture: Sindar wear long tunics and flowing silken robes. They speak Sindarin, but also know Westron as well as the tongues of their Noldor and silvan brethen. Many Sindar are spell users, and are are literate. The Silvan wear functional green and brown tunics and hose, at sea a garb of greenish-blue hue. They speak their own silvan dialects - and a few word in Sindarin. Few know Westron, apart from the ones traveling the land of the Prince. Religion: they revere the Valar. Autonomous Principality. Dor-en-Ernil is technically a provice of Gondor, but in fact is much more independant and treated like an state of its own. Unlike the other regions the Prince rules his state with enormous autonomy and his voice is one of the most important in Gondorians affairs- just behind the King and the Steward of the Kingdom. Dor-en-Ernil is a absolute monarchy with feudal structure. The Prince is an autonomous ruler. He pays annual support to the King, but he rules as he sees fit. The land is held in fiefs by the lesser Nobility of Belfalas and Dor-im-Nîn (S. "Land between the Waters") in the North. 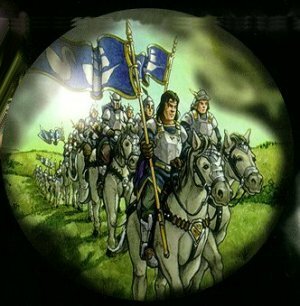 These vassals pay annual tax, must enforce the laws in their domains and join the Princes Army as well as serve in the garrison of the castles three month a year. All of them join the Princes Army in wartime, many of them building the heavy cavalry of the realm. Seventeen families hold 90% of the land. Some local positions are elected. Dor-en-Ernil is devided in administrative regions, led by a Warden (more urban regions) or a Banneret (more rural regions). In wartime the Prince can raise an Army of 8.000 to 10.000 warriors. The core of Dor-en-Ernils military powers lies in its mounted knights, who are rivaled onlyby the Eothraim for their horsemanship and are, in fact, the only true cavalery between Anfalas, Harondor and Anorien. The navy has a couple of coastal patrols, the famous White Ships and war galleys. Some privateers call ports of Dor-en-Ernil their homeport. The elven port of Edhellond has a guard which is not part of the army, but may join the fighting side by side with their allies. They have lightweight chain hauberks and are armed with spears and either longbows (Sindar) or shortbows (Silvan). Elven sailors wear leather breastplates and falchions. The Eredrim rarely serve in the Princes forces. Eredrim troops are, unless trained, poorly disciplined and prefer wild charges and single combat. They wear rigid leather breastplates, full shield and broadswords. Some sign on as mercenaries for foreign wars. To other Dunadan the Court of Dor-en-Ernil is remarkably "elvish". Knights and their wonderful Ladies dance in the great hall to the melodies of the finest harpers in Gondor. Heroes rise to propose quest to far lands, and challenge one another to joust at forthcoming tourneys. Court life is a cycle of hunts, tourneys and entertainment. The most important tournament of the year is in may, when the most skilled swordfighters from all over Gondor meet in the the Lower Bailey of the Castle. One tourney is held evey season except winter. 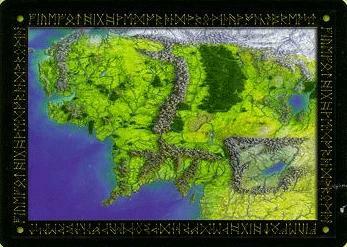 Gondor is frequently at war with the south and the east. Umbar is the most dangerous enemy. Even as Dor-en-Ernil was neutral in the kin strife, it now stands on the Gondorian side and is a target for corsair raids and vice versa. The Umbarian seapower is superior the the Gondorian, but they lack the skilled land forces. 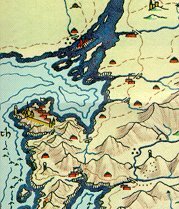 Nevertheless, merchants of Dor-en-Ernil weigh anchor in corsair controlled ports, and ships from Umbar and allied ports are seen in Dol Amroth and Linhir. The only true ally of Gondor are the Northmen who live east of Mirkwood. The contact with Arthedain is low, Cardolan is nearly out of control and the Elves of Edhellond normaly mind their own affairs. The Eredrim are a possible enemy in the heart of Dor-en-Ernil. The clans of Ered Tarthonion do not resist the Prince openly, but he takes comfort when the Hill-folk remains at home. The Eredrim consider their situation as a constant siege, but they know a war against the Prince would prove hopeless. Mostly they show their position with no more than a hostile stare. The Great Tournamant in may is the most important event in Dor-en-Ernil. For one week the whole city is the place of one big celebration. Roquen and other noble men from Dor-en-Ernil, Gondor and even sometimes from farer places challenge one another. There are also other events like shooting with longbows and a fair. In august the Princes Divison Tournament of Nen Dagor takes place in Dol Amroth. The people and their position within the structure of the society of Dor-en-Ernil can be found here. The list has the following structure: titel - name (level) - starting date - special location - list of missions, jobs, abilities. Since Arleod ascended the throne of Dor-en-Ernil in 1667 the warcraft has improved. The Princes guard Black Rose was set up, led by Terilaan - an former leader of the Elite Guards of Womaw. Like Arleod he is a Warrior Mage, and till 1688 about a dozen men are able to use some war magic in this force. Also a mobile force in Harondor of 500 men was set up to guard the southern border of Gondor - and Dor-en-Ernil as a wealthy country takes more than half the cost of this force. This unit was 1694 brought back home and a mercenary unit called Nardu Phazan (adun. Princes Men) was formed. The Prines forces gain more fighting experience than any other soldiers in Gondor. In autumn 1673 Prince Arleod sends some of his Roquen south to build up a mercenary force with the intend to support the political and economical interests of Dor-en-Ernil in Far Harad. Bûr Esmer - a town in Bellakar north of Bozisha Dar - becomes the HQ of the Free Legion, a Numeorian mercenary force led by Roquen Rinhil Tarthonian. The Free Legion establishes camps in Ostelor, Tûl Harar and Malkier. In spring 1691 Dor-en-Ernil anounces an official alliance with Bûr Esmer (city of Bellakar) and the Dominions. White Swan on a blue ground. Dol Amroth is the capital of Dor-en-Ernil and with Edhellond one of the most famous ports in Gondor. It was founded with the aid of the Elves in the beginning of the Third Age as Lond Ernil (S. "Princes Haven"). In 1640 T.A. about 10500 people live here, mostly Dunadan and some even with some elvish blood. Surrounding the hallowed Cove of the White Ships, which serves as the cities war-barbor, the White Town is the home of the naval warriors and their families. It is also the center of the local woodcraft, sailmaking, armorer industries and the best place to look for skilled craftmen like cartographers. The most famous taverns are the The Turtle-fish and The lost Elf. The Middle Port is renowned for its ship-building and fishing industries. Here, wrights trained in the ancient Elven shipmaking skills produce the finest sea-going vessels in all of Gondor: the famous White Ships. The Middle Port also houses a lot of related artisans as sailmakers, coopers, carpenters, ropemakers, etc. The major Guildhalls can be found here. The New Port is Dol Amroths only open harbor. Larger than the other ports, it accomodates wharf serving visiting vessels and its warehouse and market are capable of handling the city´s tremendous volume of comerce. Inns and taverns are found serving those who wish to avoid the Gate Town or the high prices found in the Castle Quarter. This is the eastermost and outermost district, lying on the low saddle just inside the main landward entry through the city walls. Being the dirtiest and roudiest neighborhood in Dol Amroth, it is still kept finer than the quarters in most other cities. It is the most colorful distric, but even here street crime is low. The most famous taverns are Arthoniels Tavern, The black Spar and the Sign of the Blind Voyager. Above the Old Town and below the castle quarter is a large series of terraced buildings. The upper reaches cater to the castle garrison and contain numerous taverns and gaming halls. Here is also the Academy of Dol Amroth. The quarter is located on the upper flanks of the Hill, just under the fortress. A short causeway and a pair of drawbridges join this destict to the castles outer bailey. Most of the wealthy make their home here. Also fine inns and taverns are found. Silver bridge on blue ground (region). Three white seven-edged stars on a blue ground. Spathlin is situated in northern Dor-en-Ernil at the rivers Ciril and Ringlo. The population consists of 820 people at 1640 T.A., but develops to nealy 1000 people in 1691 T.A. Spathlin is the administrative center for the fertile lands south of the Ringlo and famous for its cattle fair in summer. Quay on a blue ground (town). White mountain and quay on a blue ground (region). Sarlond was a little town on the eastern coast of Belfalas. From 1669 on it developed as the most important port for ship building in Dor-en-Ernil behind Dol Amroth. It is the administrative center for the coastal region between Linhir and Methrast as well as for the mountain region of Eredost. In 1677 is gets famous when two coastal patrols from Sarlond broke an Umbarian naval siege on Linhir by leading the hostile ships into shallow waters. Fortir is the most nothern town of Dor-en-Ernil. It is between Spathlin and Ethring at the river Ringlo and ruled by Lord Lotharion Fornglin. The important trade route do not go across Fortir, but it is the center of this agricultural part of Dor-en-Ernil. Endil (S. Mid-point) is half wy between Dol Amroth and Methrast. It is the center of the Dor-en-Ernil coastal beacon system. The watch tower is on a lonely islet a mile ofshore, the town is the center for the Nargond region, of which traditionally the eldest son of the prince bears the title of Banneret. Tiriel is a coastal town between Sarlond and Methrast. A small harbour is one mile away of the city, which was build a bit higher on the cliffs and overlooks the bay of Tolfalas. Vinhir is the capital of Methrast, only a few miles off the fortress Bar-en-Hyarmen. Edhellond is a famous elven haven west of Dol Amroth.It was founded by Sindar who arrvied there in the Second Age. The Elf-haven occupies a 150´ high hill that rises out of the lower Morthond less than a mile from the Bay of Belfalas. The rocky hillock forms a 1500´ long isle, which is just over 500´ accross at its widest point. Three stairways connect the gently taraced hillock with the quaye below. The town is surrounded by a low white wall and a ring of silvery oaks. The four high towers with blue tiled roofs sparkle in the clear sky.